Hardware-accelerated text, video, and graphics mean your websites perform like the programs that are installed on your computer. High-definition videos are smooth, graphics are clear and responsive, colors are true, and websites are hyper-interactive. 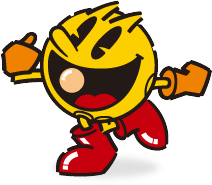 PAC-MAN is a cultural icon whose popularity has crossed the globe for 30 years. His journey through the maze of gaming infamy continues on across each new generation!